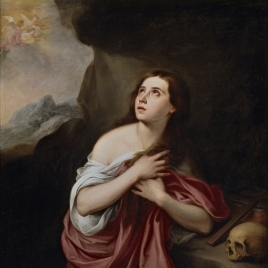 In 1836, the English critic John Ruskin lavished praise on Bartolomé Esteban Murillo’s technique and identified the uniqueness of his approach: It is true that his Virgins are never such goddess-mothers as those of Correggio or Raphael, but they are never vulgar: they are mortal, but into their mortal features is cast such a light of holy loveliness, such a beauty of sweet soul, such an unfathomable love, as renders them occasionally no unworthy rivals of the imagination of the higher masters. Ruskin’s appreciation is a fit description of the particular Virgin in this marvelous example of a devotional painting by the preeminent seventeenth-century Spanish painter of Seville. In this work the artist creates a strikingly beautiful pair of figures whose serene poses and serious facial expressions project an aura of sadness without sentimentality. The Virgin is seated on a stone bench holding the Christ Child, who stands with one foot on his mother’s left leg and the other on the bench. He is beyond infancy, tall enough to be at eye level with his mother. With their touching cheeks and physical connection, the figures display the most tender and heartfelt gesture of love. Together they look at the viewer with solemn and subtle expressions of devotion for the object of their gaze: the worshipful spectator. Murillo was a member of the Confraternity of the Rosary, a society dedicated to the worship of the Virgin Mary, and as a devotional painting, The Virgin of the Rosary was created to serve as a visual aid to a viewer engaged in praying the rosary. Indeed, the rosary is at the center of the composition. Both figures grasp it, and the fact that they do not finger the beads as one would do while reciting the Hail Mary or Our Father underscores the rosary’s symbolic nature here, and for Murillo. These holy figures are not engaged in prayer, but inspire piety on the part of the spectator, who might be kneeling in prayer while meditating on the mysteries of the rosary. A stone ledge elevates the holy figures and separates the viewer from them, emphasizing their significance and function. In earlier versions of the theme, the Virgin holds the Infant Jesus on her lap. In this version, Murillo changed the pose of the Christ Child, who now stands on his mother’s lap, turning in contrapposto, with his left hand on her right shoulder and his other hand just visible in the shadow of his mother’s face. With her right hand, she covers the child with a white cloth, a symbol of purity, and clasps the rosary. She holds him with a light but firm maternal touch. Murillo’s naturalistic figures communicate a spiritual message of love and sacrifice. The Virgin of the Rosary is a fine example of Murillo’s early style. The figures are painted with careful modeling to achieve solidity as well as grace and beauty. With her heart-shaped face, delicate lips and nose, and dark, limpid eyes, this Virgin is the image of holy loveliness. The artist employed a variety of brushstrokes to define textures. Thick strokes give solidity to the folds of red and blue drapery, while the diaphanous olive-green veil surrounding her head and one shoulder is created with a lighter touch of the brush. 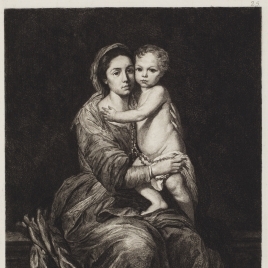 Mother and Child are brightly illuminated against a dark background, displaying the tenebrismo (the strong contrast of light and dark) characteristic of this period in the artist’s oeuvre. Murillo was a master of vibrant color: The Virgin’s saturated red dress is a striking complement to the brilliant blue mantle draped over her lap. The earliest record of this work is its acquisition by Charles IV in 1788. Murillo was a popular painter with the monarchs of the new Bourbon dynasty when the Court was based in Seville, and a number of his works were purchased for the royal collection. 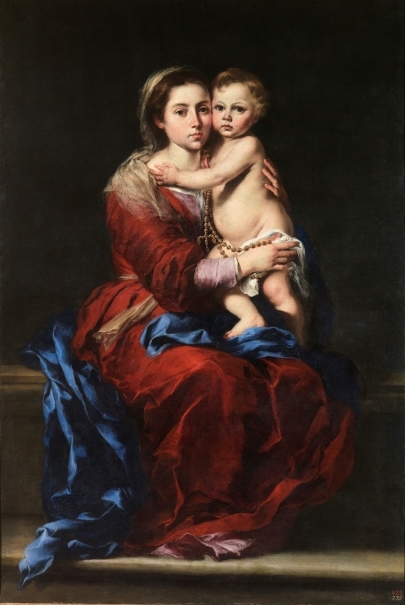 The Virgin of the Rosary may have been produced initially for a member of the upper-middle and professional classes of Seville, the city in which Murillo lived and worked all his life (Text drawn from Lipinski, L.: El Greco to Goya. Masterpieces from the Prado Museum, Museo de Arte de Ponce, 2012, p. 118). Height: 166 cm. ; Width: 112 cm. Royal Collection (Palacio Real, Madrid, cuarto del capitán de guardias, 1814-1818, nº 275; Real Monasterio de San Lorenzo, El Escorial-Madrid, 1819-1827). Palacio Nuevo de Madrid, [s.n], Madrid, 1794. 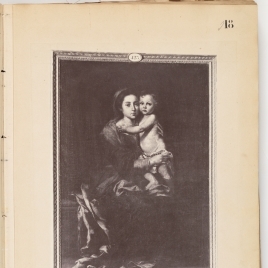 Trens, Manuel, María: iconografía de la Virgen en el arte español, Plus-Ultra, Madrid, 1946, pp. 321. Gaya Nuño, Juan Antonio, La obra pictórica completa de Murillo, Noguer, Barcelona, 1978, pp. nº35. Esteban, Claude, Tout L'Oeuvre Peint de Murillo, Flammarion, Paris, 1980, pp. nº35. Velázquez y la pintura española de su tiempo : cuadros del M, Museo Nacional, Tokio, 1980, pp. nº27. Angulo Íñiguez, Diego, Murillo, Espasa-Calpe, Madrid, 1981, pp. 157. Bartolome Esteban Murillo 1617-1682, Royal Academy of Arts, Londres, 1982, pp. 160. Bartolomé Esteban Murillo: (1617-1682), Ministerio de Cultura, Dirección General de Bellas, Madrid, 1982, pp. 160. Museo Nacional del Prado, Museo del Prado: catálogo de las pinturas, Museo del Prado, Madrid, 1985, pp. 450. Fernandez Miranda y Lozana, Fernando, Inventarios Reales. Carlos III. 1789-1790. Vol. I, Patrimonio Nacional, Madrid, 1988, pp. 32. Anatra, Bruno, Venezia e la Spagna, Electa, Milan, 1988, pp. 176 / lám. 193. Valdivieso, Enrique, Murillo Sombras de la Tierra, Luces del Cielo, Silex, Madrid, 1991, pp. 73. Triadó, Joan-Ramon, La Pintura Española. El Siglo de Oro, Carroggio, Barcelona, 1999, pp. 138. Museo Nacional del Prado, Pintura barroca española: guía, Museo Nacional del PradoAldeasa, Madrid, 2001, pp. 176. The Heart of Spain : A Rare Exhibition of Spain's Religious, Alexandria Museum of Art, Lousiana, 2003, pp. 87. Alvarez, Mari-Tere, El Alma de España = the Soul of Spain, The Alburquerque Museum, Alburquerque, 2005, pp. 208. Black, Charlene Villaseñor, Creating the cult of St. Joseph : art and gender in the Spa..., Princeton University Press, 2006, pp. 99 / lám. 53. Pintura española de El Greco a Picasso : el tiempo, la verda..., Sociedad Estatal para la Acción C, Madrid, 2006, pp. 250-251. El joven Murillo, Museo de Bellas Artes de Bilbao :, Bilbao, 2009, pp. 298-301. Valdivieso, Enrique, Murillo: catálogo razonado de pinturas, El Viso, 2010, pp. nº52 p.302. El Prado en el Hermitage, Museo Estatal del Hermitage: Museo del Prado, 2011, pp. 146-147. Del Greco a Goya. Obras maestras del Museo del Prado, Museo de Arte de Ponce. MNP. AC/E, 2012, pp. 44-45. 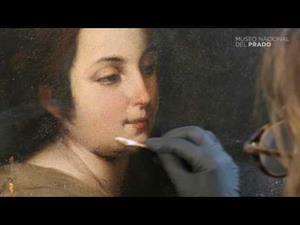 Prado captive beauty: treasures from the Prado Museum, Mitsubishi Ichigokan Museum, 2015, pp. n.42. 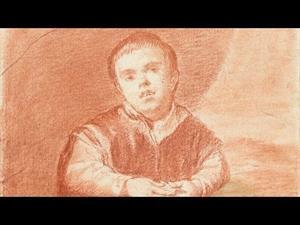 Ortega, I, 'Bartolome Esteban Murillo. Inmaculada Concepción / Virgen del Rosario' En:, Murillo y su estela en Sevilla, ICAS, Instituto de la Cultura y las Artes de Sevilla, Sevilla, 2017, pp. 210-213 n.30 n.31 (o.r). Inv. Carlos III, 1789-1790. Núm. 240. Inv. Fernando VII, Palacio Nuevo, 1814-1818. Núm. 275. Catálogo Museo del Prado, 1854-1858. Núm. 423. Inv. Real Museo, 1857. Núm. 423. Murillo. / 423. La Virgen del rosario. / Está sentada, con el niño cariñosamente abrazado, y entre ambos tienen un rosario en la mano. / Alto 1 pie, 10 pulg, 8 lin; ancho 3 pies, 11 pulg, 6 lin. 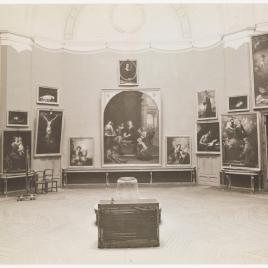 Catálogo Museo del Prado, 1872-1907. Núm. 870.